There's no question that Fernando Alonso and McLaren did a great job to secure what can only be described as a great team victory at the Nurburgring, but the downside for the boys in silver was that Lewis Hamilton's amazing run of podiums finally came to an end - and yet, it didn't have to. In the early stages of the race he survived a collision, puncture and trip into a gravel trap, and yet despite being lapped by the leader, he still had an opportunity to earn what ultimately could have been third place. Alas, in the very difficult circumstances that prevailed at the time, McLaren made a call that didn't work out, and Hamilton ended a dramatic weekend that saw his luck seemingly change by the minute without a point to his name. It was, his bosses agreed, all part of Hamilton's ongoing learning experience. "I enjoyed the race, to be honest," said Hamilton afterwards. "I was pushing as hard as I could to catch up, and obviously Fernando drove a fantastic race, and congratulations to him. But the fight is still on. "It wasn't the best race, but it was still quite good fun, trying to come through the field, and sort of not really knowing where you were or where you were going to end up. It was quite close at the end, I could have got a point, but it just didn't happen this time." Hamilton's weekend began to go awry, of course, when he went off in qualifying. While the Briton was uninjured in that crash, he had nevertheless suffered quite a big bang, and there must have been some element of shock and bruising involved. And yet on Sunday, the morning after there was no hint whatsoever that his equilibrium had been disturbed. Impressive. That was pretty clear at the start, where he fairly rocketed off the line. This year we've seen him tussle with Ferraris and his own teammate on the first lap, and it was great to see him have a go at some slightly easier targets - no disrespect to the drivers concerned. 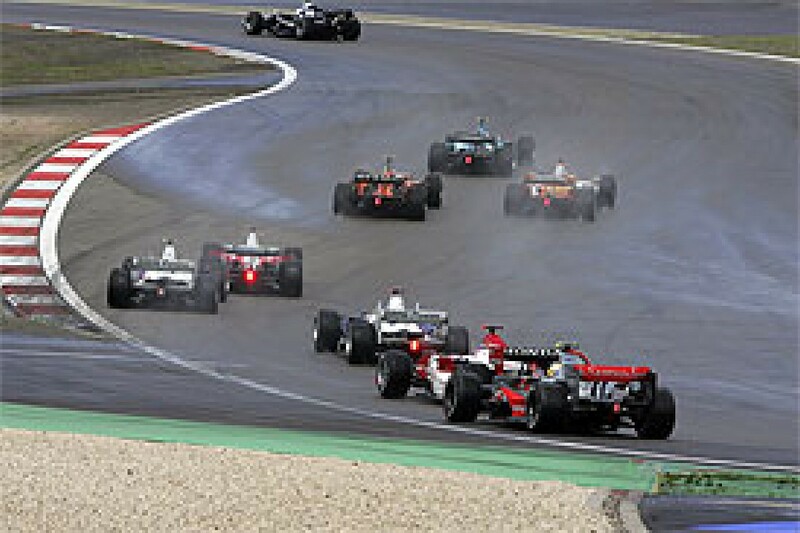 By the exit of the first turn, and with the rain already coming down, he had dealt with Ralf Schumacher, Jarno Trulli, Heikki Kovalainen and Mark Webber. When the BMW drivers began tripping over each other into Turn 2, Hamilton could barely believe his good fortune, and he made the right call in going wide round the outside. But it wasn't quite wide enough - he clipped the rear impact structure of the spinning Robert Kubica, breaking the BMW's rear light, and in an instant his left rear tyre went down. For a few seconds Lewis held fourth place, but he was helpless as the field streamed past him. But again, luck swung his way. By the end of the lap it was clear that wet tyres were necessary, and as most of the field came into the pits, he at least had a chance to change the punctured tyre at a time when everyone else had to stop too. When he came in, only Rubens Barrichello, Adrian Sutil and Nick Heidfeld were still behind him, all of them having been delayed by incidents. Despite having to service Alonso first, McLaren did a better job than some other teams with twin-stoppers, and Lewis immediately jumped back ahead of Schumacher, Nico Rosberg, Scott Speed, Tonio Liuzzi and Anthony Davidson. At the end of lap two those who had not stopped the first time (either by design or accident, in the case of Kimi Raikkonen) had no choice but to come in after a treacherous extra lap. And Lewis passed the lot of them. As he charged across the line, he was in effect in eighth place, and about to devour Kovalainen for seventh. From having a puncture just a couple of minutes earlier, that wasn't too bad a recovery. Then it all went wrong. Jenson Button had already gone off so Hamilton was due to gain another spot, but instead he hit a wall of water that had suddenly descended, and went sailing straight on into the gravel trap. Pictures showed the car parked just a few centimetres short of the tyres, but when I showed him one after the race, Lewis confirmed that he had in fact just clipped the barrier and moved back. Various other drivers soon joined him in the gravel, and it seemed certain that his day was over. But Hamilton had other ideas, and after consultation with his pit, he decided to stay put. "I think it started with a great bit of driving to get up to fourth," said Ron Dennis. "But he just clipped one of the BMWs and picked up a puncture. He came round very slowly. Then of course by that time it had started to rain. "Then we switched to intermediates, but of course he was a long way back. Of course he spun off, but there was quite quick thinking on the pit wall, and he kept the engine running. He just sat there and got picked up, but of course lost a lap, and lost time." Watching from the other side of the tyre wall, Tonio Liuzzi could hardly believe his eyes. "I didn't understand what the hell was going on," the Italian said. "I saw Lewis in the car, he was picked up, and pulled in the air. And then he disappeared! I thought it was nice to be able to do that, because usually when you're in the gravel trap you should come out of the car. "What the marshals tell us is to jump out of the car, and it's over. But he waited maybe three minutes in the car, with the engine on, they picked him up, put him back on the circuit, so it was really weird to me." Liuzzi added that had his own car sat there with the engine running for so long, it would probably have 'caught fire'. But this wasn't about good fortune. There are sound technical reasons why the McLarens (and to be fair, Ferraris) can sit comfortably at the end of pitlane with engines running for three or four minutes prior to the start of Q3. On this occasion, that ability came in handy. "It's not a question of luck," said Martin Whitmarsh. "There is a system on the car that should stop it from stalling and protect it so it doesn't stop - that's not luck, that's development. The fact that you can run the engine for that long without overheating is development, not luck..."
Nevertheless, Lewis was fortunate that the marshals on the spot played the game. Had someone tapped him on the helmet and made a 'kill the engine' gesture, he would have had to obey. Instead, though, the guys did an exceptional job to hook Hamilton up and drop him back on to the track. A grateful Lewis selected first, and went on his way: "It was just unfortunate, it was very, very slippery, I got caught out, and just went straight on. But thank you to the safety guys, they helped me get on." 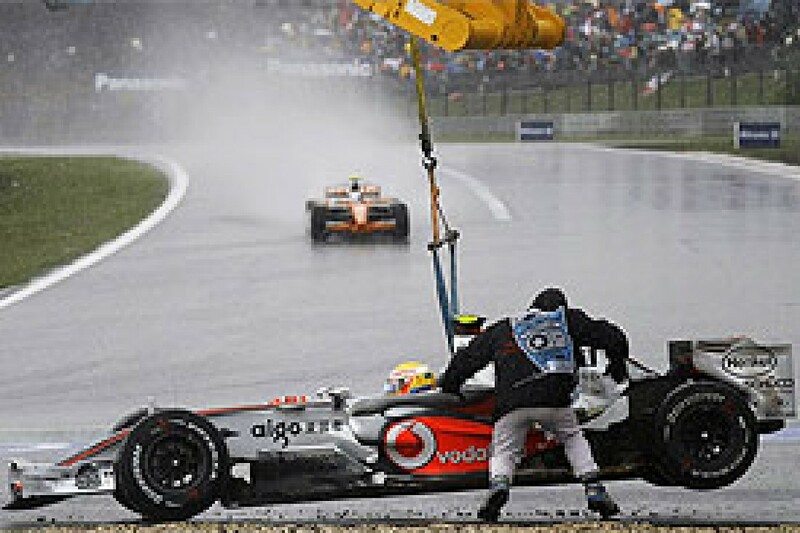 Just before the crane set him down, Hamilton was passed by the Spyker of Markus Winkelhock, whose team had made the inspired decision to bring him in for intermediates at the end of the formation lap, something no one else had the foresight (or guts) to do. Despite just coming out of the pits after a second change from intermediates to extreme wets, the German still had a huge lead, and as he passed Hamilton, he put the McLaren man a lap down. Both then got in line behind the safety car. A red flag signalled a race suspension, and at the end of the lap they stopped on the grid. 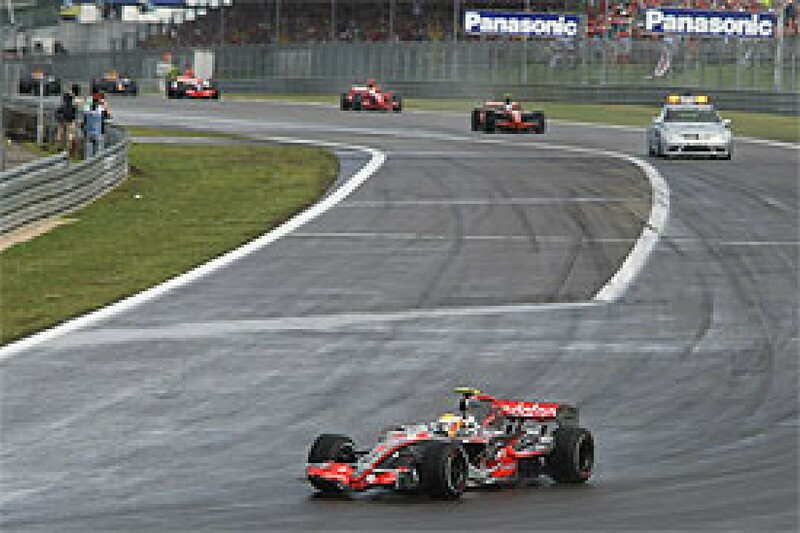 There was a long wait until the rest arrived, led by Felipe Massa, an indication of how difficult conditions had become. There was some degree of confusion at that point. 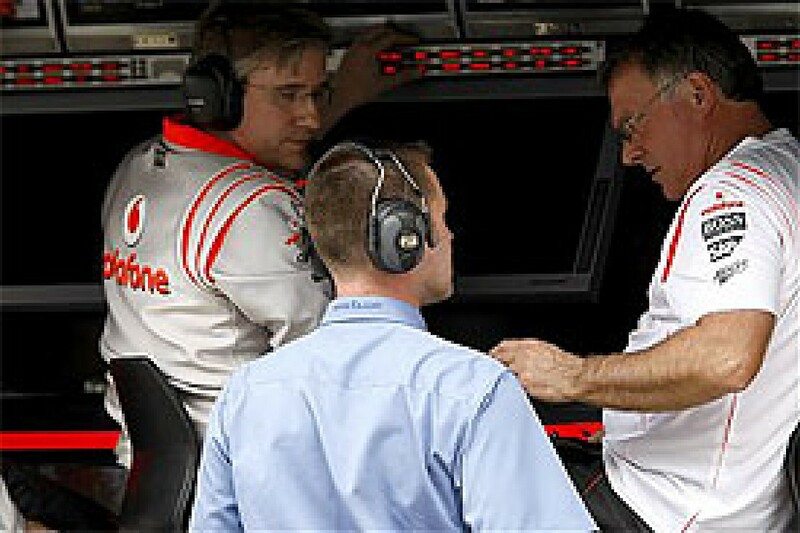 McLaren were adamant that Lewis had not been lapped, despite the fact that the timing showed Winkelhock as leader and the McLaren was clearly sat behind him. The way the rules work in these circumstances is quite clear in the sporting regulations. 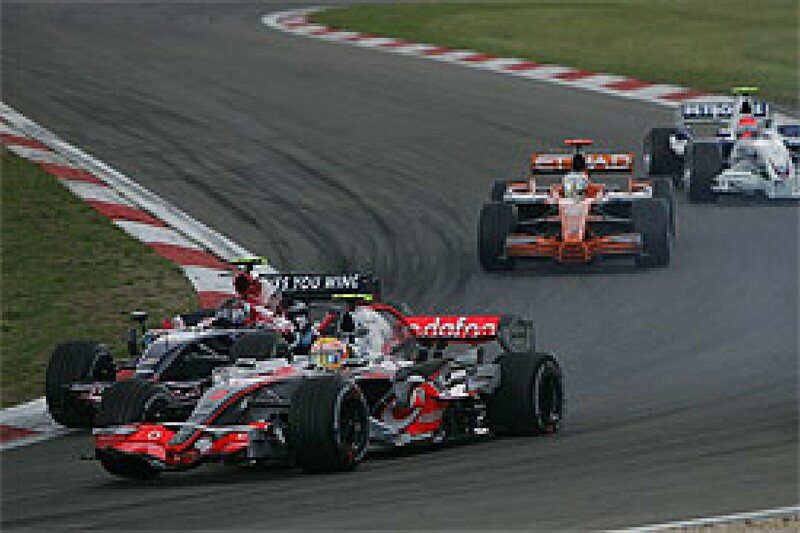 As of 2007, any cars that are lapped and in the way of cars on the lead lap are able to gain their laps back. They do that by driving away from the grid a few minutes before the scheduled restart, and joining the back of the field. It's exactly the same procedure as when the safety car is running around - in Canada we saw Anthony Davidson get his lap back. "At some point after the three minute signal, which will be dependent upon the expected lap time, any cars between the red flag line and the leader, in addition to any lapped cars between cars on the lead lap, will be waved off to complete a further lap, without overtaking, and join the line of cars behind the safety car." The FIA had a lot to deal with at this point, trying to untangle what had happened, and dealing with urgent enquiries from all of the teams. In addition, a hiccup with the timing system had seemingly 'lost' the last laps of six cars that had either gone very slowly or had been pushed across start/finish line at the red flag, and thus had not triggered the system. The screen implied that those cars had perhaps gone missing or maybe pitted, but they were physically on the grid. Those laps then had to be retrieved and the order verified by the timekeepers. What soon wasn't in doubt up in race control was that Hamilton was a lap down, but McLaren insisted that he wasn't, so that created some uncertainty while the matter was checked. At some point, McLaren asked if they could push Hamilton to the back of the grid - basically the team felt that's where he belonged, in 17th and on the lead lap. There was no real precedent for this move, but race director Charlie Whiting agreed to let them do it if they wished. The reason for this strange occurrence was simple: It's not written down in the sporting regulations, but it's understood that teams cannot work on their cars during a suspension until they are in their rightful grid position. So for Lewis, was that second, as on the road - or 17th, as he was on the timing screens? Keen to get to work checking the car, McLaren decided that opting for 17th was the safest option. Intriguingly, after the race Whitmarsh continued to insist that Hamilton had not actually been lapped, and was under the impression that the FIA had asked the car to be pushed back, rather than the other way round: "When the race was stopped, he was not lapped, so he should have been able to have started without being lapped. "In fairness to the FIA, there was a lot of information and confusion. They believed that he had been lapped, and therefore we were asked to move the car to the back of the grid, which we did. We didn't think he'd been lapped, on our data, so we warned the FIA that we did not think he'd been lapped. I suspect they were getting various queries from lots of people, in fairness to them. And we then waited and waited." 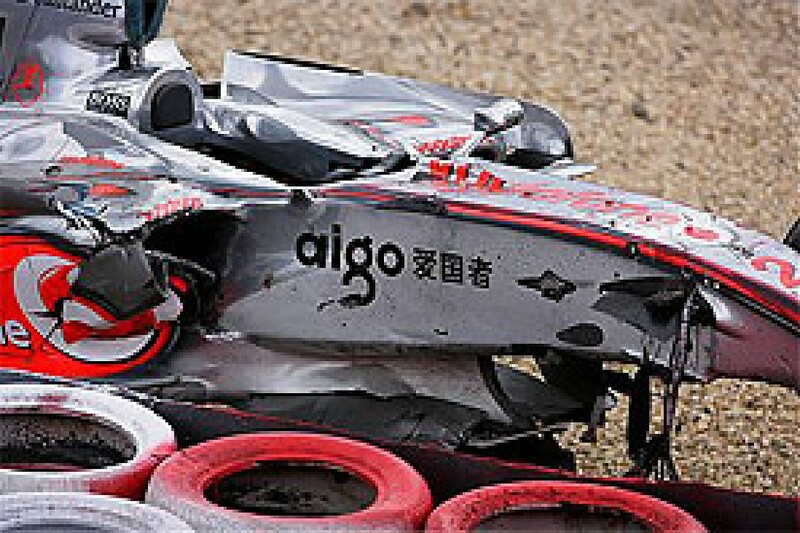 While discussions continued, McLaren had another problem to contend with. Lewis had not escaped unscathed from his trip into the gravel. "When we went to warm up the engine," said Dennis, "a stone had gone up the starter motor hole, and it was jammed. It was seven and a half minutes to go, and it took five minutes to get the stone out, and we were able to start the engine." Eventually all the timing fell into place, and having heard from the timekeepers, the FIA could confirm what it thought all along, that Lewis was a lap down. What should have happened was as noted earlier: before the restart, Hamilton should have been able to drive round and rejoin the back of the queue before it set off. But matters had been confused by the fact that the car had been pushed to the back so that the team could work on the car without worrying about a penalty, instead of sitting second in the queue behind Winkelhock. In effect, Hamilton was in his rightful place, 17th and at the back. So why the need to wave him round? There were two issues. Number one, to officially regain a lap he had to physically drive it in order to satisfy the requirements of the timekeepers. And number two, he had to physically drive it in order to use up some fuel. If he didn't, he would in effect be given an extra lap of race fuel at the expense of everyone else. Dennis was well aware of the fuel issue: "We were sort of saying what's the point of driving round the whole lap - why don't we just stay where we are? They wanted us to use a lap of fuel. So that wasted time." The problem was that the FIA had committed to a 2:35 pm restart, and getting Hamilton to drive through the crowded grid and all the way round was impossible at this stage. But the facility existed to 'correct' the lap problem, by allowing him to drive around once the cars had left the grid. This is exactly what happens when a safety car is out and lapped cars are waved around. A crucial piece of our story is provided by Article 42.5s, which clearly states: "The safety car will enter the pits after one lap unless ... all cars are not yet in a line behind the safety car." 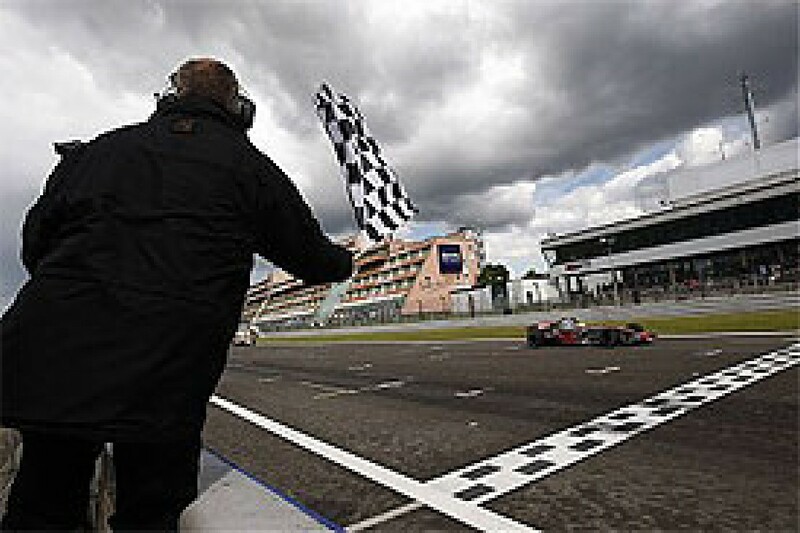 The implication is simple - safety car driver Bernd Maylander was obliged by the rules to wait for Hamilton to catch up the queue again before the race could resume. As an added complication this time, the safety car ran for a lap and half with Hamilton at the very back before - following various confirmations back and forth - Lewis was told by his team to overtake the whole field. He finally passed the safety car on the start/finish line as the race finished its sixth lap. He was now officially on the same lap as Winkelhock and the rest, and in effect within two laps he would have been on the tail of the group and the restart would have taken place. But then an extraordinary thing happened. Instead of charging on round to join the pack, he came into the pits to change to dry tyres. Within seconds, race control gave the signal for the safety car to come in - it happened to be just shy of the pit entry, so there was time for Maylander to respond. When the field was released and crossed the line, Hamilton was just starting his lap, and was thus way short of catching the pack. So what happened? Race control was fully prepared for Maylander to stay out for however long it took for Hamilton to catch up. But by pitting, he in effect forfeited his right to have the safety car and the queue wait for him. In other words, his tyre stop actually made the safety car come in early. Think about it - for all the FIA knew, he could have been coming in with a technical problem or similar. And if several cars lapped were popping in and out of the pits while trying to catch the queue, there would be total chaos. Added to that, getting a lap back and being allowed to start from the back of the queue is already a bonus. To then take strategic advantage by completing a tyre change while the process was underway would have been complete nonsense and utterly unfair on anyone else. In the Indy Racing League the pits are closed during wave-bys for just such a reason. This rule isn't set in stone within the race suspension part of the F1 sporting regulations, but there is a relevant reference in the section on wave-bys behind the safety car: "They must then proceed around the track at an appropriate speed, without overtaking, and take up position at the back of the line of cars behind the safety car." Stopping in the pitlane clearly doesn't fall under the auspices of this definition. Anyway, there was apparently a misunderstanding at McLaren, and that's made clear by how Dennis and Whitmarsh each described what happened. 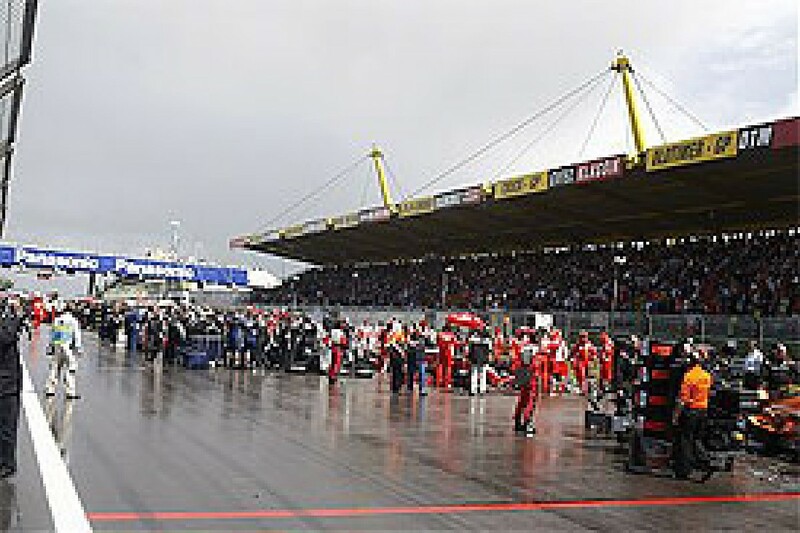 Ron clearly anticipated that the team would be allowed to make their stop and catch the queue: "Then we thought, right, let's take a risk, because it had stopped raining. There was a lot of debate about what we could do, and Lewis finally decided to go for dry tyres. He stopped and he was still able to catch up, but of course the safety car immediately came in. So he hadn't closed on the grid. If he'd closed on to the back, then we'd have been alright." In contrast, Whitmarsh said that the team believed that the safety car was coming in anyway, and there was nothing to lose: "By that stage, it was a lap and a half into the safety car period. We knew the safety car was coming in, and the conditions weren't that easy either, so he couldn't get back round in time. So at that point we said, 'What do you want to do, Lewis, do you want to jump on to dries and take a gamble?' and he felt that was worth a gamble. So that's what we did. "We could see by then that the safety car was going to come in, he wasn't going to catch the back of it in that time, so he was going to be in no-man's land. And when you're in that no-man's land, you just need to do something different. So we knew we had the pace, but we also knew that we were in that difficult position." The Tyre Decision: An unnecessary gamble? In effect, the decision to put Hamilton on dry tyres was an expensive mistake. The Woking guys are in a nice, cosy factory, while I was down at Turn 1, soaked to the skin and trying to wring out the pages of my soggy notebook. The sun was out, but I was looking at a very wet track that was in no way yet suitable for grooved tyres. When the TV pictures showed Hamilton coming in for dry tyres, I could scarcely believe my eyes. It's interesting to note that both Dennis and Whitmarsh implied that the final call was made by Hamilton himself. After all, he was the one out on the track, and during his brief spell trying to catch the pack he had the chance to sample the track at racing speeds. Someone in the McLaren camp also pointed out that on Friday afternoon Hamilton had gone out straight away on a still damp track after the lunchtime deluge that stopped GP2 practice, and thus had some experience of a drying track. On the other hand, it's worth recalling that it had not rained when Hamilton drove on the Tuesday of the previous week's Spa testing, when he might have gained some useful experience of crossover conditions. But the key thing is this - what information was he given over the radio? Whitmarsh clearly implied that Lewis was told that the safety car was going to come in anyway, and he had nothing to lose with a tyre change. Presumably that ultimatum tipped the balance in favour of a change. Had he been told that if he kept going round the pack would wait for him, and a tyre change could be postponed until whenever, he might have made a different call from the cockpit. "He was asked for an opinion," said Whitmarsh. "He's got a certain amount of information, and we've got a certain amount, and it was a team decision. We took the decision. We could have made the call, but we asked him what do you want to do? It was one of those, 'do we accept a throw of the dice to see if we could get a good outcome', and I think it was not quite the right decision as it turned out..."
In fact, Hamilton was well and truly stuffed. The track was so not ready for dry tyres that he went off a couple of times on his out-lap, and was immediately put a lap down again by new leader Felipe Massa. His first lap, including the time spent at rest and the drive out of the pits, took two minutes and 41 seconds; those who waited a bit longer for the track to dry would run out-laps of as low as 2:03 (in the case of Massa). In other words, on that very first lap on dries Lewis in effect gave away 38 seconds compared with what would have happened had he waited. His second lap was 12.6 seconds off Massa's pace, and his third was 3.8 seconds off. His fourth was around 0.6 seconds faster. Now he was on the right tyres at the right time, but the damage was already done. He had thrown away over 54 seconds to Massa just in terms of the dry tyre performance over his first three laps. And that doesn't take into account the fact that he had not been in his rightful position at the back of the pack. He battled on gamely, but from where he was, getting into the points was going to be a long shot. Lewis himself couldn't be faulted from a driving point of view, as Whitmarsh agreed: "For many parts of the race he was the quickest out there, which was a fantastic job, and he did all that he could in the circumstances. "Of course he's disappointed - having started a career and had nine straight podiums, to not have a podium is a bit of a shock to the system. But it's a fantastic job, and he'll take a lot out of this weekend. "He had a big shunt, which was the team's fault, and bounced back from that, and still I think he would have had a good race here. He was quick in the dry, and it was part of the learning experience. He's done a fantastic job this weekend, and the first thing he does when he gets over the line is apologise to the team for the mistake at the beginning of the race. He's a remarkable character, and just an absolute team player." So what could, or should have happened, had McLaren played things differently? Let's imagine that Lewis had not come in for dry tyres when he did. Had he continued on round he would have caught the pack and the restart would probably have come at the end of lap eight, instead of lap seven as a response to his tyre stop. He would have had to stay in 17th place until crossing the line, and then he would have been free to go for it. Hamilton's tyres would have been nicely warmed up, and so would he. During his solo catching up lappery he was the only driver able to sample every puddle at racing speeds, and thus he would have had the confidence to push to the limit at the restart. There were some tough cookies in the way, but let's say be conservative and guess that he would have made it to seventh or eighth by the end of the third lap after the restart. After a well-timed stop for dries he would have no doubt quickly gained a few more, and given Kimi's retirement, would have been on course for an eventual third - and six priceless points. And a final thought. What if the team, after Hamilton's crash in qualifying, had saved all that rebuild effort they put in on his chassis and taken the easy way out by starting the original spare car (and fresh engine) from the pitlane? A disaster normally, it could have produced a very different outcome. From the pitlane, Lewis would not have been obliged to have his final choice of tyres fitted on the grid with three minutes to go, like all the rest. In reality, the grid tyre decision can't be made with much less three and half minutes to go. Consider also the time it takes the field to do their formation lap, and you can probably add another minute and a half before a driver in the pitlane had to make his final call. So anyone starting from the pits would have perhaps had an extra five minutes to appreciate the fact that the rain was coming in at such a speed. He would have been able to make the call to go straight to wets, and would still have got down to the end of the pitlane to join the pack as he went past.